Traveling around in Cuba can be extremely cheap, or quite expensive, depending on your choices. You can get a 150 km ride for just a few dollars with the old and slow governmental buses, or a 50 dollars bus ticket from Pinar del Rio to Trinidad. Inside Havana, almost everything is walking distance if you are staying in the right place. Discovering by foot the charming city is, probably, the best part of the trip. However, sometimes a coco taxi (an auto rickshaw-type taxi) or an old American classic car, are always a good choice. Upon my arrival in Havana, I booked absolutely nothing, I just wrote down a note with an address in Centro Havana. It was Rolando hostel’s rooftop where I introduced myself in the local ambiance, with a local mojito and a nice view over Habana Vieja. The place is a good choice for solo travelers, but not that cheap. The price for 8-bed dormitory it was the same with a single room in a casa particular I have found just a few (disrepair) blocks away from the hostel. And what a brilliant move that was. This old woman’s casa particular offered me an insight about Cubanese house’s ambiance and decoration. Her cooking skills and life stories added flavor to my stay. When negotiating the room price in a casa particular, in Cuba, is better to include in the full price breakfast and, sometimes, dinner; the added value is good! My breakfast in a casa particular was typical cubanese: coffee, juice, bread, honey, eggs, cheese and ham. The local coffee, often home grown in back gardens and home roasted, gives a sense of Caribean morning feeling. As well the goat cheese or pork ham, after you see these animals walking freely in the countryside’s fields of joy. At lunch time I always preferred a peso street stall like El Rapido or Burgui. In these local fast-foods, pizza or sandwiches are cheap as 10 CUP. As for dinner, I usually had it in casa particular for about 7 CUC and I was never disappointed. There was always good quality and vast proportions, plus they cooked whatever I wanted, as long as they had it. Fish with vegetables and potatoes was my favorite. In Havana, I tried as well Hector’s pizza. This is a rooftop place, at the corner of Calzada de Infanta and calle San Rafael. You will know you got there when you’ll hear someone in the street shouting for Hector to come out the window. The customer orders his pizza, and when it’s ready, senor Hector lowers the hot meal in a basket, that returns back up with the cash inside. Habana Vieja is also the place to have some drinks in the evening. I started a tour of the bars, the moment I realized I might seriously miss Havana’s flavor. I liked La Muralla, O’Reilly, and Bilbao, but was not impressed about Bodeguida del Medio. This is Hemingway’s famous bar, a bit overrated and with a much more Western fragrance than Cubanese, not quite what I was looking for. 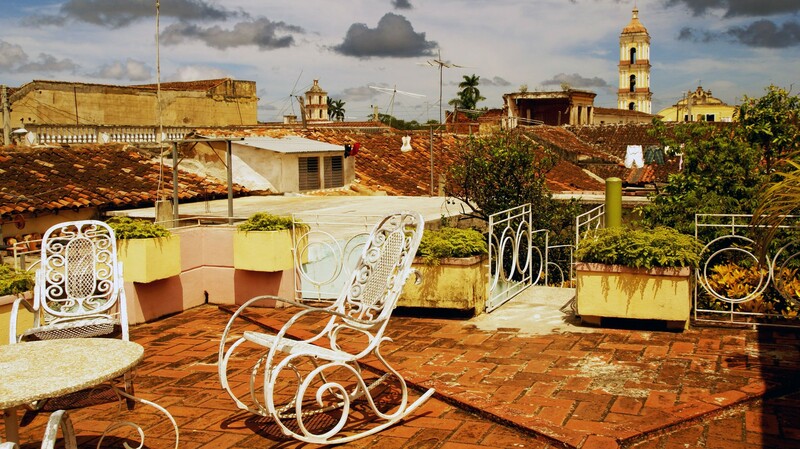 Actually, in Old Havana, it doesn’t take an effort to find some live music at one of the many terraces. The strolling musicians will come and sing for you, either you want it or not. Havana Vieja is one of the best things UNESCO has done, with an impressive preservation of the buildings. In a similar fashion, the people restore their cars and preserve a period of time. The old town’s atmosphere is given by the Spanish buildings and old American convertibles that resonate all around with the sound of salsa. Catedral de San Cristobal is a fine example of Cuban baroque architecture style. I visited it on a Sunday morning mess, where young and old Cubanos came there for the mess. Music was provided by a small choir, accompanied by instruments including keyboard and drums. The church felt so alive. I liked to see it is used by its community, not just as a museum or an old building to visit. Surrounded my mansions, Plaza de Armas houses dozen of charming second-hand bookstalls that offer probably the greatest selection about Che, Fidel, the Cuban revolution, and communism. I got myself many souvenirs from here. El Capitolio is a replica of Washington DC’s Capitol. The striking white building sits tall in the center of the city and its dome rises above the roof tops like a watchtower. It houses also a museum which has interesting items. Nearby this huge building, there is Teatro Nacional and Parque Central, a good place to sit and watch the world go by. Calle Obispo links Plaza de Armas with Parque Central in Habana Vieja being the place where the beautiful ladies of Havana come to shop or meet with their friends. If nothing to shop, you can buy some tasty sandwiches for just 20 cents. Centro Habana is part of the city that captures its real life. It starts with El Capitolio, a working class neighborhood, where plenty of the buildings are in an advanced state of disrepair and it ends with Havana’s University. The markets in Centro Habana are noisy yet lively, with plenty of aromatic vegetables or tropical fruit. There are also live animals for sale alongside the beans, garlic or avocados. The market sellers offered me so many fruits to sample, that I only had to buy few vegetables to complete my fresh salad. The most charming part of Centro Habana is, however, El Malecon. The historical boardwalk is the gathering point for locals, like a social scene for Cubanos. It is the best place to mingle with Habaneros and learn about their lives, challenges, and dreams. It is the site of romantic couples, sad individuals, happy or pensive ones, is where the soul of the city stays in.